Bennetts public house was constructed between 1832 and 1878. It has two storeys and is three rooms wide by three rooms deep. 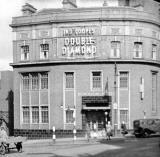 Borough Hotel, Trinity Street, Hanley. This three storey public house is currently named The Roebuck. It is located on Leek Road a short distance from Stoke-on-Trent train station. Broadway, Meir. Photographed by William Blake. This two storey building is two rooms wide by two rooms deep with a two storey projection on the east side. Number 2 Mountford Street has been modified to form part of the club.